Be one of the very first to grow this recent introduction, it adds an amazing tinge of colour to a mixed perennial garden. Almost disregarded and thought to have something wrong with it, tests revealed it is 100% healthy and is actually a completely natural colour break (called a 'sport'). The green edges become more pronounced the older the plants get, and take a couple of years for the fresh lime green tips to be at their best. Striking in a mixed border where it will really stand out, but just as ideal for pots and containers on the patio, it's a hardy perennial that will keep coming back year after year, even bigger and better! Supplied as garden ready plugs to plant straight out in the garden or into pots. A real unplanned find by its German breeder, it was first found in the seed production fields of the ‘Magnus’ strain, and was thought to be caused by a virus or disease. Hauls of plants were destroyed until it was later discovered that there was absolutely no virus at all and that the amazing two-tone colour is actually a 100% healthy and natural break, called a ‘sport’! This means flower colour is split into two and blends in the middle. The bright green edges become more pronounced the older the plants get, and take a couple of years for the striking lime-green tips to be at their best. The green blends to flurescent pinky/purple towards the base of the petals as they join to the large round eye. There is some variation in each plant creating totally unique flowers which all add to its natural attraction and eye-catching formation. 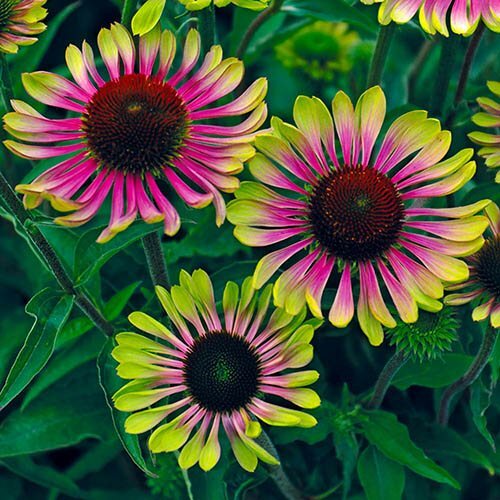 Being a ‘sport’ from 'Magnus’,the proven best Echinacea variety for decades, its guaranteed to give exceptional garden performance, weather resistance and flower robustness – a real reliable yet extraordinarily different perennial plant! Supplied as a pack of 3 garden ready plugs, ready to plant straight out in the garden or into pots and containers. Cut back stems as the blooms fade which may encourage further flowering; flowers may be kept on the plant for winter interest and are a good source of seed for birds. Grow in well-drained, humus-rich soil, ideally in full sun. Plants will grow in light shade. Protect from excessive winter wet with a mulch. Plants are generally pest free but young growth may be damaged by slugs. You can choose to pot them on in a greenhouse or plant them straight into their final position in the garden or large patio pots where they'll romp away to give you great results in less time.